Box cars are fully enclosed cars with either single or double doors that are either sliding or plug. Because of the versatility of this car type, a wide variety of products can be handled in this car including but not limited to pulp, paper, lumber, wood, food products, and motor vehicle parts. 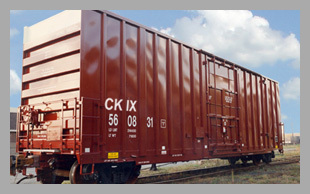 See tabs for specific boxcar specifications.